This entry was posted on Sunday, August 10th, 2008 at 12:54 pm and is filed under Uncategorized. You can follow any responses to this entry through the RSS 2.0 feed. You can leave a response, or trackback from your own site. As far as buildings go—and the ones mentioned and shown here, I think the world would not be the same without them. The human touch is very present in such overwhelming architecture. Starting from the Pyramids of Giza to the WTC. These bold forms stick up from the earth and dominate the landscape. They represent solidity, endurance, chance, adventure, power and a desire to be the best. While not noble qualities in themselves, they nonetheless are on the human scale. Sometimes ugly and big and deformed and odd… but very human. Scale is a question of relativity. These buildings are arguably soul less only because their shear size dwarfs any means of comparison to the human beings they serve. According to this entry in order for a building to retain its humanity it is to not exceed 10 stories. That is simply silly. The author also seems to have a problem with uniform stream lined shapes. Things don’t have to be rough or improvised in order to be imbued with a so called humanity. Plenty of things in nature are based on ideal shapes and solids, the most banal of all of course: the human skull. Perfectly spherical. Is that inhuman? Skulls are not spheres…no matter. Buildings over 10 stories are fine. I love the Empire State Bldg, the Chrysler Bldg, the Woolworth Bldg, to name a few old ones that are much taller than 10. Modern ones too. The examples here seem to deny human scale, to reject it, to want to crush it! Big is not bad, necessarily. Interesting and thoughtful posts on this blog. Appreciate this entry (as well as the one on Duchamp’s Given–which is initially how i landed here). If you’re talking about human scale in architecture, yes there is its physical size in relation to the greater landscape, as in…how well does it play with others on the playground…but there’s also the experience of actual human scale of the interior—how does it relate to the individual being in that space and what is that experience. I think Rem Koolhaas is very aware of the individual human experience and respecting the perceptual intelligence of the participants of his buildings, as well as asking important questions about architecture as space as well as objects in the larger playground of stuff. Yes, well, I’m always hesitant to make comments on building I haven’t actually visited! 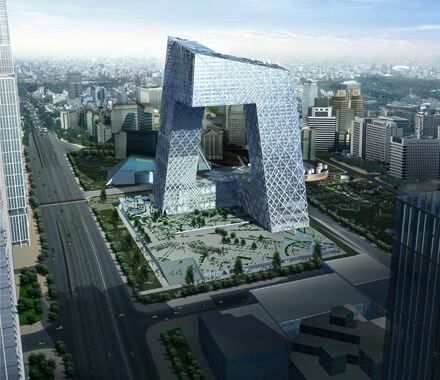 I hope I can see some of Koolhaas’ stuff soon.